Dental decay is one of the most prevalent diseases worldwide. At the Stag Lane Dental we adopt a preventative approach to ensure that dental decay is avoided where possible. This involves coaching our patients on how to improve their diet, oral hygiene habits and provide fluoride advice. However in the unfortunate situation where decay does occur the treatment of fillings are a way of repairing teeth that are damaged by decay or trauma and therefore restoring their strength, appearance and functionality. The benefit of these fillings are that they virtually imperceptible when compared to natural teeth and function to replace the tooth structure, which has been damaged by tooth decay. Can I replace my existing amalgam fillings with composite fillings? Yes, though we generally recommend that fillings of any kind be replaced only when this is clinically necessary: for example, where decay occurs beneath or around an existing filling or a filling breaks. Sometimes, when the existing fillings are very large, a composite filling may not be an option - a porcelain inlay may be required. Our clinical audit data shows that 96% of the composite fillings we place on front teeth last for more than 5 years. 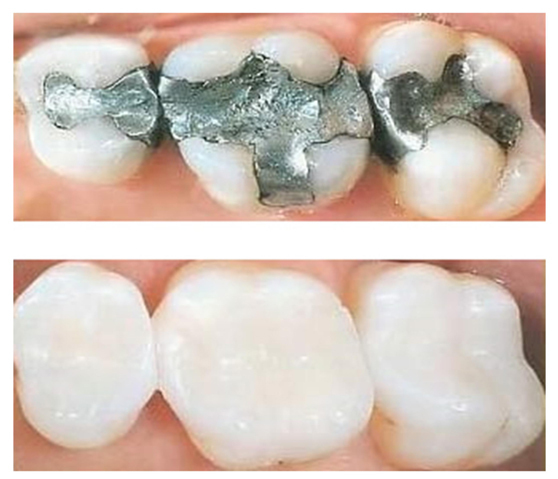 We are so confident of the quality of our composite fillings.